Respiratory specialists including physicians, surgeons, physiotherapists and nurses. Potential participants (i.e. self referrals). should be available to referring health professionals and provided to the coordinator of the pulmonary rehabilitation program. The coordinator would normally be a health professional in charge of running the program. If the patient is a self-referral, the coordinator should check the patient’s eligibility with the patient’s general practitioner or respiratory specialist. 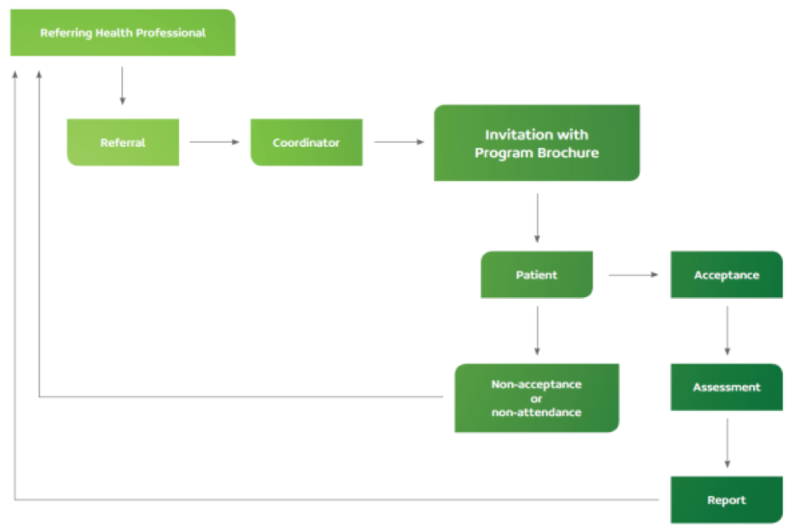 Following referral to the program, the coordinator should invite the patient to attend via an invitation letter or a phone call. An explanation that the patient has been referred to the program. The start date of the program or an appointment for assessment, as appropriate. Options for parking and transport. The coordinator should correspond with the referral source, the patient’s general practitioner and other relevant health providers. Correspondence should include an initial assessment letter and a final assessment letter, which summarise the results of assessments made before and after the program, respectively. If patients do not respond to the written invitation, a “did not respond to correspondence” letter can be sent to the referring health providers. The flow chart below outlines the appropriate lines and methods of communication for referrals.